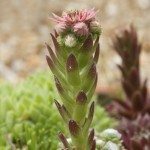 My hens & chicks plants all have a lot of brown at the base of the plant but the tops are still nice and green. Are they dying? Can they be saved?